What is the correct oil pressure for an Austin 10/4 and should it vary with revs. Is 30psi at tick over hot and cold an indication of a problem? Your 30psi oil pressure is fine at about 35 - 40 mph. The oil pressure relief valve must have been set at 30 psi. However 30 psi at at tickover when the oil is hot is a bit puzzling. Normally I would expect the oil pressure to drop to about 15psi at tickover when the oil is hot. Are you sure that the oil is really hot. It probably takes about 30mins of driving for the oil to become really hot! Or your bearing oil clearances are very good! Thanks Bill. Maybe oil wasn't very hot but nothing to worry about then. I have a similar problem until recently the oul pressure gauge acted a bit like a revcounter increasing and decreasing with the engine revs but whilst away in Belgium in her last month the gauge started reading a steady 28psi until the engine is switched off. Interestingly we hit a speed bump a bit hard just after this started happening and the gauge started reading normally again for a few miles. Since returning home I have cleared the feed to the gauge using the airline and run the engine briefly with the oil union to the gauge disconnected to see what the engine pushed out (a bit black and sluggish) but the engine was cold so that would have an effect. Just sounds like a sticking pressure gauge to me. You can by new ones fairly cheaply or remove the pressure gauge and give the internals a good clean with a cleaning fluid or petrol. Sounds like something may have moved in your tube to your gauge possibly restricting it, or causing the gauge to stick. If it was dirty when you disconnected the gauge it may be time to give your oil ways a good clean through as Bill has said, and possibly an oil change. When did you last drop the sump and clean it & the gauze strainer, and how much sludge was in there? As it is relatively easy to do, it might also be worth checking the oil pressure relief ball and spring if your pressure is dropping very low at tick over as it may be letting oil past it. They are relatively cheap and available from the club shop so possibly just change them anyway. When I rebuilt my engine I was surprised how worn the spring was and the ball had a definite circle worn into it. Before my engine rebuild, my oil pressure would drop as low as 5psi at tick over, and rise to around 27-30 at around 40mph, and would be lower when hot. As I cleaned every part of the engine when I rebuilt it, I now use Comma 20W50 Classic oil and get 28psi cold regardless of rev's and 30-32 when hot wether revving or not. I think the new spring and ball helped with this, along with the regrind and new bearings, but the type of oil will have an effect too. I wouldn't have gone for this oil though if I had not been 100% confident everything was spotless. A surprising amount of sludge builds up in all the corners of the engine over time with a standard single grade mineral oil in our old engines with only a gauze to collect anything as you can see from the picture below inside my timing case when I dismantled it. I had changed the oil not long before I did this so an oil change won't move the build up either. Thats why its always important to clean the sump and the gauge strainer when we change the oil, and change it regularly. so I took out the bolt and lock nut and the spring from the nearside engine block which is the pressure relief valve ...so far so good. on closer inspection I could see what appeared to be a ball bearing lodged in the bottom of the drilling I assume the return back into the sump. I tapped and fretted at it but it was lodged tight. I then tapped it with a thin punch and it disappeared. I assume it has gone into the sump. I can only think you have driven it through the seating? The ball can only come out the way the spring did. I can't remember what the seating sits in. If its part of the casting or a removable treaded item from the inside of the block. I scanned through my photos which don't help me either. Don't think you have a choice other than drop the sump off and have a look.. I think it has gone down the drain hole which leads to the sump. Not certain yet; but the oil has to go somewhere when the ball lifts of it's seating. What I don't understand is how the ball became lodged in the first place,it was quite a way from it's seating. But you are right and I have drained off the oil in preparation for removing the sump etc. I will report back as soon as there is any progress. We've gone a bit off the subject of what the correct oil pressure should be but my understanding was that it should be better than 15psi on tick over (800 rpm approximately for those who want to measure it) and about 30 psi at 30 mph when the engine has run for 30 minutes and is warm. However, I had a 10/4 engine with a broken ring on all four cylinders and it still showed 30 psi at 30 mph with a warm engine. The main issue is that a low oil pressure below 10 to 15 psi indicates something is wrong with the main bearings and I don't start to get worried until the engine struggles to achieve 20 psi under any conditions. Also there appears to be a great variation in the pressure gauges. I would first check the copper pipe connections and if you have a spare gauge check one against the other. I fitted a water temp/ oil pressure gauge from an MGB to my Lichfield and for some reason although both gauges have been thoroughly reconditioned and calibrated there is a 5 psi difference in the indicated pressure. 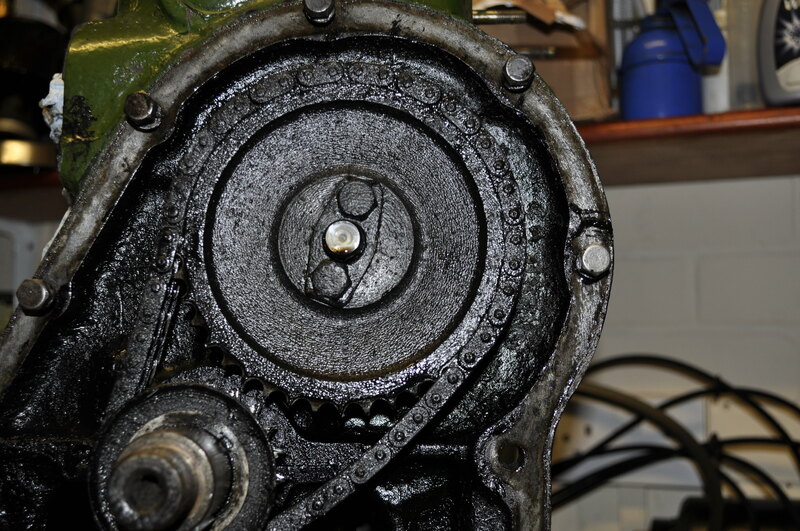 The other thing that can effect the dial pressure is the hole in the timing gear allowing oil to lubricate the chain. If this has been opened up to improve the lubrication (an approved Austin period modification) it will reduce the dial pressure by between 2 and 5 psi. Assuming that there are no air leaks or undue wear in the carburettor and timing correctly set then once the car is fully up to running temperature, I would expect a steady idling speed closer to 500 rpm. With certain exceptions, 800 rpm is more normal on 'newer' cars from perhaps the 60's / 70's onward for example.